Set oven to 275 degrees. Line jelly roll pan with foil and spray with Pam. Lay out crackers, covering pan. Melt butter and sugar together in sauce pan until bubbles form. Pour mixture on crackers and bake for 10 minutes in oven. Remove from oven and sprinkle with chocolate chips. Place back in over for 1-2 minutes to assist with melting. 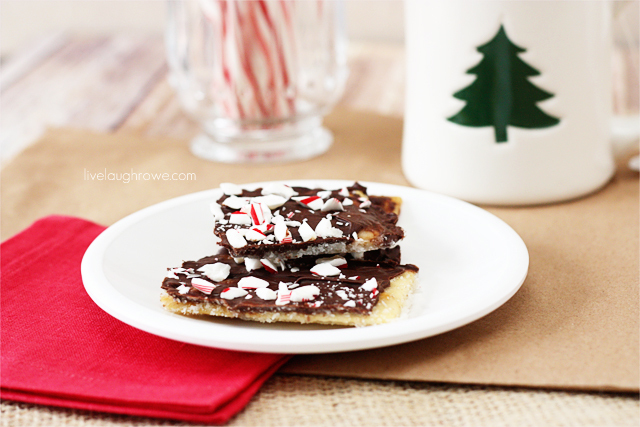 Spread chocolate around with spatula and top with crushed candy canes (or festive decor/toppings of choice). Put in refrigerator until hardened.